While I’ve never donned the Princess Kay of the Milky Way crown—an honor given by the MN Dairy Princess Program each year (And yes, winners’ heads are actually carved out of butter and put on display…), I’ve recently gained a bunch of nifty blog awards. And like the C.D.’s question, the warm fuzzy flurry raised surprise and suspicion: Hmm…Did my mother put you up to this?? 2. Natalie Hartford: Life Out Loud: Be yourself…Everyone else is taken. WINNERS! Please pass your award on to 15 others and share 7 “random facts” about yourself and the award logo on your blog. For more details, visit: Versatile Blogger Award or Leibster Blog Awards. Have fun! 1. I’m an ambi-vert—equal parts intro./extro. 2. I’m the average of my parents’ heights: 6′ 4″ and 5’3″. 3. I’m a sagi-corn or capri-carious—depending on which horoscope’s better. 4. I like kids, especially my coolio niece pack, but don’t intend to have any. 5. I do, however, parent an American bull dog named Zoe—a.k.a., my heart. 7. My first novel, IN HER SHADOW, is a psychological thriller that began as a memoir. Gotta ask. 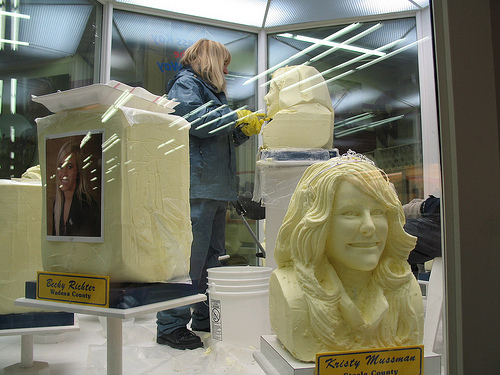 Have you ever had your head carved out of butter? Other foods? What odd questions have strangers asked you? thank you. I’m honored to be on your radar. I’m ambidextrous. Also, everyone asks if I’m Italian or South American. My looks are mostly influenced by cherokee indian on both sides and german. how lucky you are to give so many awards and make so many people happy. I look forward to checking out these blogs. Congratulations on the blog awards, August! I love those butterheads. LOL! Thanks, Sheila! I grew up aware of them and they still strike my funny bone. I’m sending buttery love and big thanks your way August, but I’ve got one question: Did my mother put you up to this?. Ha! Our mothers must be friends… Even if she had, I’d have beat her to it. Wow. I wouldn’t have believed it without the picture. I’d rather have my head carved in chocolate, so I could eat it afterwards. Congrats on the blog awards and thanks for giving us some new blogs to check out. Chocolate! What a fabulous idea, Emma… From your mouth to head carvers’ ears. So what happens to the butter heads once the fair or whatever is over? That’s a LOT of butter! Ha… Glad you’re tickled, Marcy! And I bet you’re an awesome pal and role model for your friends’ tykes. Which writer was it that said if you wanted to take writing seriously, don’t have children? Well, I already f’d that one up. Ooh! Sorry. Potty mouth. Congratulations on all the pretty shinnies! You are completely deserving. I will have to check out some of these blogs here that I have never heard of. Someone SAID that?? Man, I need a copy of that quote. *noting to self: Google it! * I certainly don’t believe having children is detrimental to our creativity or careers… (In some cases, it probably helps. Look at you, prima skilled at both!) On occasion, someone gives me the “but you have to have children!” speech. I appreciate the friendly ammo. Did you say potty mouth? LOL! That and apologizing for almost cussing….You’re too funny, Debra! I’m pretty sure Paula Dean needs to be carved out of butter. That would be her kind of heaven. Me? Not so much. Still, that’s pretty darn funny that the guy asked if you’d ever been carved out of butter. Funnier still that you knew what he meant! Congrats on the awards! All very well-deserved. 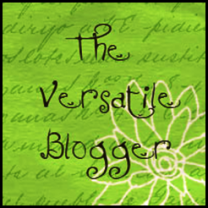 Thank you so much for bestowing on my the Versatile Blogger Award! You’re so awesome, August. Seriously. What a brilliant idea! I should contact the Dairy Association pronto… I’m sure the MN State Fair would welcome the queen of all-things-butter. Thanks for the kudos and you’re WELCOME for yours. Your blog has been one of my favorites from the get-go! OMG! I never heard of butter carving! Congrats on your awards. Nice revelations, too. I’m also one of those women who loves kids, but will never have any. We’re a strange breed, I hear. Always nice to connect with other women who don’t want/have kid-lets. I read that 25% of women choose not to have children nowadays…But it’s amazing how much criticism and pressure there can be—fortunately not in this circle. We’re so blessed to have so many options, right? I respect all of ’em. Where do I dispute some of the awards? Sorry, Cadbury… No disputing your award. You can dispute it on your own blog, however. If you do, happy to join the debate! What a great example of paying it forward with eagerness! What fabulous bloggers August. Congratulations to you all! You never cease to amaze (and amuse) me, August! I am truly honored to have been named on your list. You certainly deserve EVERY accolade you receive! And since I did procreate (twice!) and one of my little blessings is allergic to dairy… I wonder if you can “carve” Earth Balance?? See what motherhood does to you?! Thanks for your sweet words, Jana! They mean so much. Butter head ot not, August, you’re a real sweetie pie! Thank you August, I really appreciate it!! When you start the band, I’m in! August, great post. I want my little dog, Duke’s likeness carved in butta! I’m so touched, MJ! Wish I could chisel a Duke sculpture for ya… How bout this. If I ever l learn to carve anything out of anything, Duke will top my list. What an interesting thing to have done as recognition of someone. A butter-head. Got to love the imagination of that. And the skill. It looks really good. Thank you for posting all of these links in one spot. I look forward to looking at them and finding more blogs that are good. And congradulations on being nominated for so many yourself. It’s definitely a few steps outside normal. Such things make life interesting, though, right?? Hope you find the links helpful! Hilarious! I’m a former LA actress turned writer myself Thank you for the awesome list of blogs! Aw… It’s a super transition, right?? We’ll have to swap stories sometime. Enjoy the links! I couldn’t be happier Would love to swap stories sometime! Thanks August! Butter is my second favorite food after chocolate. I would love love love a carving of my head in butter, but I’d feel guilty for biting my own head off. I’d still do it though. Congratulations to all the winners! This seems to be a season for the blog awards (I just hosted one, Fabio and his wana1011 class did too, plus Debra Kristi (Krager) as well!!!). So much fun. Congrats on all the awards and award love. No butter carvings that I’m aware of, you never know with the Internet. I love No. 7 too. Very interesting. I have a twin sister, so I’ve heard a lot of weird questions. Thanks for the recognition August! Can’t say that I’ve ever had my head carved out of butter. Being from the South I’m pretty sure that any butter sculptor around here would be endlessly frustrated by passers-by slicing off chunks of his work to spread on biscuits and such. Thank you so much for visiting me today! Glad to have found you!